Available for purchase from Xbox Live Marketplace. 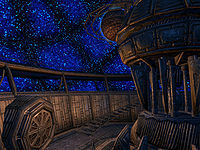 The Orrery is an official download for Oblivion, adding a new quest to repair the Arcane University's Orrery. Restoring the Orrery grants you a greater power that will fortify one attribute while draining another. The particular power that you receive is based on the phases of the moons, Masser and Secunda. Items — 4 new miscellaneous items and 2 letters are included with the download. 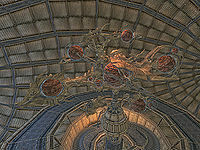 Magic — 8 new greater powers are available once the Orrery is repaired. 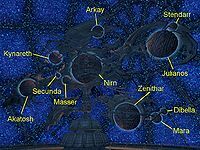 Quest — Assist Bothiel in repairing the Imperial Orrery. This letter was originally displayed on the official obliviondownloads.com website, which has since become unavailable. The text serves to provide background and context for the events of the download. From what you have told me, I suspect that not only might it be possible to return the Orrery to a functional state, but we may unlock features that have been hidden to us until now. I have long wondered about the function of the console separate from the primary mechanism; these plans you have sent suggest it might have a significant use. I have seen repeated references to Masser and Secunda, and they are clearly somehow related to this particular section of the Orrery. To what end, I cannot be sure, but I would very much like to find out. Thank you again for your assistance with the Orrery. Perhaps someday I'll have the time to visit Ald-ruhn and see these ruins in all their native glory. The door to the Imperial Orrery is present even without this download. If you use console commands to break into the Orrery without installing the download, the interior is simply an empty dome structure, scaled to be much larger than normal. This page was last modified on 28 October 2018, at 07:06.